Installing a squirrel baffle on your pole will prevent squirrels and small raccoons from climbing or jumping up to the bird feeder. Erva squirrel baffles are made entirely in the US. 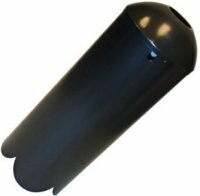 Since they are made with galvanized steel, Erva squirrel baffles maintain their attractive appearance for years, and they carry an unconditional lifetime guarantee against defects in material and workmanship.